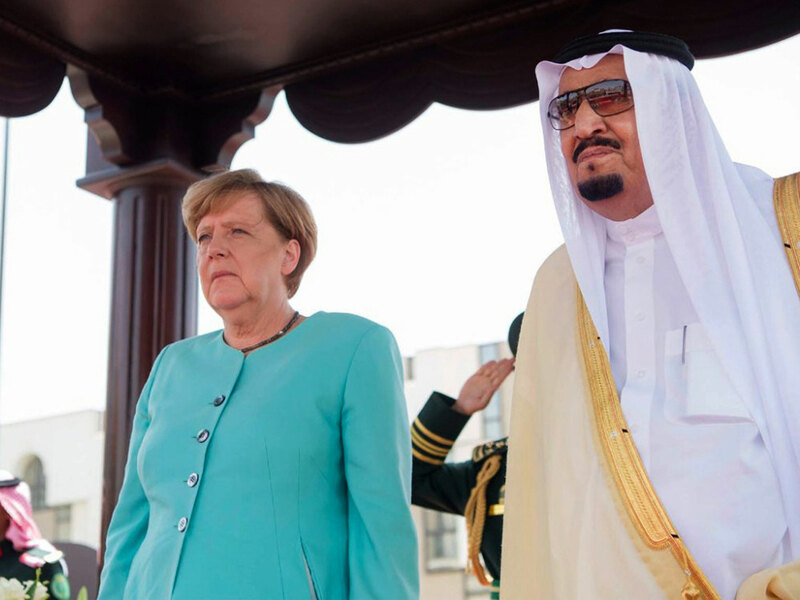 King Salman and other top officials welcomed the German Chancellor Angela Merkel on her arrival to the western city of Jeddah. Like other recent female Western visitors, Merkel, did not cover her hair on her state visit to Saudi. Prime Minister Theresa May also eschewed the strict dress code for women when she arrived in Riyadh, after saying she hoped to be an inspiration to oppressed women in Saudi Arabia. Incidentally, Merkel has called for the burqa to be banned in Germany saying “it is not acceptable in our country”. Saudi Arabia enforces a conservative dress code in public, requiring women to wear a full-length robe and cover their hair, in keeping with other restrictive laws including a guardian system limiting women’s movement and a ban on driving. The German leader is expected to press Gulf leaders to do more to take in refugees and provide humanitarian relief for refugees fleeing conflict in Muslim-majority countries. Her country has provided refuge to hundreds of thousands of people from Syria, Iraq and Afghanistan in recent years.